Fewer than 60 miles south and east from the Museum of Contemporary Art (MCA) in Chicago hangs a painting — which at one point stood sentry over a copy machine of all things — that launched a career. It was there, making copies, staring at “Rust Red Hills” by Georgia O’Keeffe, that Lisa Key ’94 started to realize the impact art — especially contemporary art — could have on herself and others. It may not have been just the art of one woman, but more likely the mentorship and friendship of one man that truly inspired her. Lisa’s interest in museums went beyond the art on the walls or statues in the gardens. She was more interested in the operations, inner workings, and behind-the-scenes happenings. Thanks to Professor Brauer, founding director of the Brauer Museum of Art, and Valparaiso University, she turned that interest into something more. With no formal art history degree program at Valpo, Professor Brauer and Lisa worked together to create a curriculum so Lisa could double major in art history and communications. The Brauer Museum of Art is home to more than 4,000 works of art from the mid-19th century to the present. The museum boasts seven galleries and regularly hosts traveling and virtual exhibits. But that wasn’t always the case. Lisa recalls the days artwork was displayed in the library basement — complete with one original painting over the copy machine regularly used by students studying or doing research. Lisa asked Professor Brauer about this later, and his response still resonates with her today and often fuels her work as chief development officer and interim director of the Museum of Contemporary Art in Chicago. “Every student uses the copier,” Lisa recalls Professor Brauer said at the time. “And if the painting is there, then every student will see it and see what I see, that it’s the best part of our collection. Isn’t that why we have it? “It was very important to him that this collection was for the students, and if they weren’t coming to it, he was going to put it where they all go,” Lisa says. To Professor Brauer’s credit, he always saw access to these great works as part of his and the University’s mission. Professor Brauer, who launched the museum in 1996, remembers why he started the museum. Its original mission statement stated that “works of art provide experiential, holistic understandings and inspiration” and “for many students, museum art experiences establish a lifelong engagement with the riches and insights that art provides.” Professor Brauer remains involved with the University and its students and alumni, and he’s able to see the enduring impact the museum has made. While certainly different in scale, Lisa’s work at MCA mirrors her early days as a student at Valpo. Lisa, who earned a master of arts administration from Indiana University’s Kelley School of Business after graduating from Valpo, is currently leading the MCA through the strategic planning process. Last year was the museum’s 50th anniversary. Lisa and her team are looking to keep the museum relevant for the next 50 years and beyond. 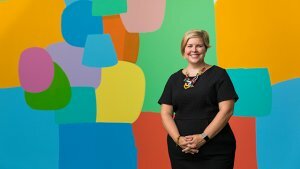 Lisa continues her advocacy of the Brauer Museum, even going so far as to establish connections between the MCA and BMA. Earlier this year, Lisa facilitated a meeting for Brauer Museum of Art Director Gregg Hertzlieb, a museum donor, and Professor Brauer himself with American artist Paul Heyer, whose art was on exhibit at the MCA. Subsequently, one of Heyer’s paintings was purchased and is on exhibit in the Ferguson galleries at the Brauer Museum of Art. For Lisa, it’s the least she could do for the University and professor who did so much for her. Who knows? Maybe a trip through the Brauer Museum will convince them to reach for their dreams. “The museum was great place for me to do that,” Lisa says.